Hyginus Gromaticus, his surname is based upon the Roman surveying instrument “The Groma”, has written several texts concerning the survey techniques of, and the methodology to be adopted when setting out the centurial grid, with the Decumanus maximus / Kardo maximus (part A and part B of this text). However, it appears from the method chosen to deliver the instructions that he was certainly not a geometre or agrimensor, but more likely an accomplished mathematician. But there is uncertainty within academia over a singular author. Are the texts in fact to be attributed as the writings of one person, and if so does this obscure the real intent of the Codex as we now read it? Was it in fact written as a text for surveyors or a theoretical construct for mathematicians? In Codex Arcerianus ‘A’, Constitutio (Limitum) or Establishment of (Limites), the author sets out his aim as follows; “There is another procedure, through which by sighting three shadows we may mark south.” These are the instructions discussed within the first section of this text, i.e. part A. But it must be clearly understood that it is the most obtuse method imaginable to locate south, (in fact you actually find East/West and South is really an after thought), and although an excellent geometrical exercise, perhaps following on from the works of Greek mathematicians, it is hardly a surveyors tool. It is an intellectual exercise unimaginable in the real world of surveying, where there is a far simpler and safer methodology. This is particularly so as the author is not worried if the exercise is in the morning or afternoon; he merely requires three consecutive shadow lines from a gnomon. 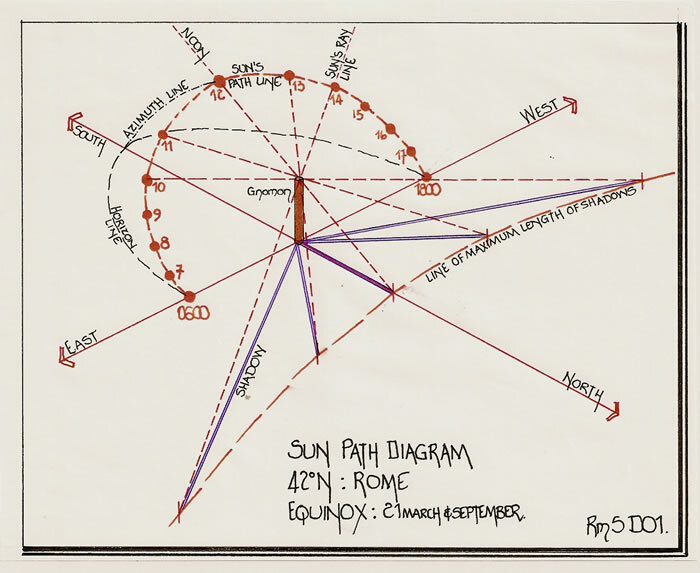 As an illustration of the Sun’s path and the information which can be obtained there-from diagrams Rm5D01 and Rm5D02 are appended referring to Rome, 420N latitude at the Equinox. 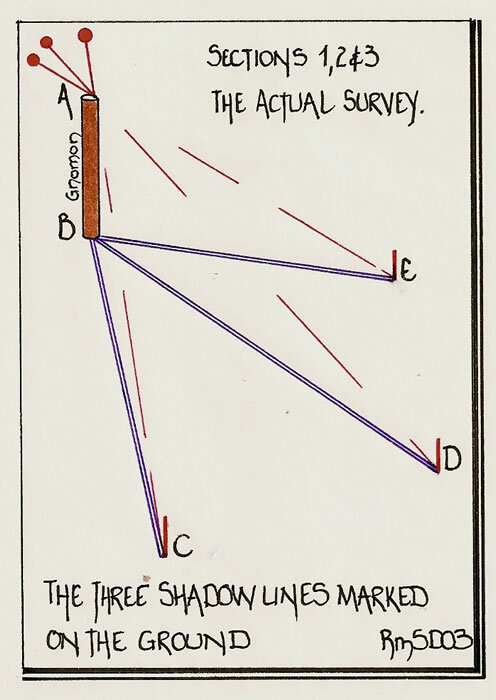 These illustrate that the variation in shadow length governed by the time of year is crucial to obtaining sufficient usable information from the shadow’s length. They also illustrate that the Agrimensor had to be aware of his latitude and therefore the shadow length available for determining East/West. Firstly, reproduced are the instructions word for word in English translation, but set out in tabular form so that each instruction can then be analysed by diagram and comment. 1) There is another procedure, through which by sighting three shadows we may mark the south. 2) We shall set up a gnomon AB on level ground and note any three shadows which it casts CDE. 3) We shall plot these shadows with the gnomon at right angles (to the ground) to discover how the shadows differ from one another in length. If we set up before midday, the first shadow will be the longest, if after midday, the last. Next we shall draw these shadows to the appropriate scale (?) on our plan, and in this way we shall preserve their layout on the ground. So, let AB be the gnomon, B the ground. Let us take the longest shadow and mark it on the ground as C; similarly, let us mark the second on the ground as D, and the same with the third, marked E.
So, on the base (i.e. the ground) there should be BE, (B)D, and (B)C, each in proportion to its length. Next let us draw a hypotenuse from C to A, and from D to A, and then with centre A and radius E, let us describe a circle. Then let us draw lines parallel to the base, that is, the ground, onto the perpendicular (AB), from the points of intersection of the circumference of the circle and the hypotenuses – from F onto G and from I onto K.
Then we shall apply the longest line, GF, to the largest shadow, and from point B we shall mark (the length of) GF; we shall apply the second line to the second shadow and we shall mark (the length of) KI. Then from points F and I we shall project a straight line and similarly from C and D, the ends of the shadows. These two lines will intersect each other at point T.
Next we shall draw a straight line from T and E.
This will mark east and west. With the same points of reference we shall establish the actual point of intersection, and we shall observe the four parts of the heavens, with which the layout of Limites based on this system always tallies. It will be immediately apparent that the instructions jump from the practical, the gnomon set into the earth, to a drawing made to the appropriate scale, or, as we would perhaps say drawn to scale. But, there is no corresponding instruction to return to the practical survey and mark East/West. Therefore in setting down a comparative text we must vary the instructions accordingly. Basically from section 5 to section 10 we are using a diagram or drawing, and from section 11 to 15 we are using the gnomon and the earth lines which must be marked on the ground. But an amendment is possible. These three shadows must be at least one hour apart for there to be an appreciable difference, and to enable later instructions to be carried out with a degree of accuracy. 3) We shall plot these shadows with the gnomon at right angles (to the ground) to discover how the shadows differ from one another in length. This means that each shadow line must be physically marked upon the ground and measured. 4) If we set up before midday, the first shadow will be the longest, if after midday, the last. The sun at noon always casts the least shadow length. 5) Next we shall draw these shadows to the appropriate scale (?) on our plan, and in this way we shall preserve their layout on the ground. We have now moved from the gnomon and shadows lines marked upon the ground to a drawing or diagram of the actual gnomon and shadow lengths. It is what we would refer to as an elevation of the actual situation with the ground line drawn horizontally and the gnomon vertically. The scale is given from the height of the gnomon and then each shadow length is marked from its base point along the ground line. However, as we are probably inferring the use of a wax tablet board for the drawing, the scale would be quite small and the accuracy therefore considerably reduced. A gnomon of 5 pedes height will produce shadows varying in length from 4 1/2 pedes to 28 1/3 pedes at the equinox on the latitude of Rome 420N. 6) So, let AB be the gnomon, B the ground. 7) Let us take the longest shadow and mark it on the ground as C; similarly, let us mark the second on the ground as D, and the same with the third, marked E.
8) So, on the base (i.e. the ground) there should be BE, (B) D, and (B) C, each in proportion to its length. 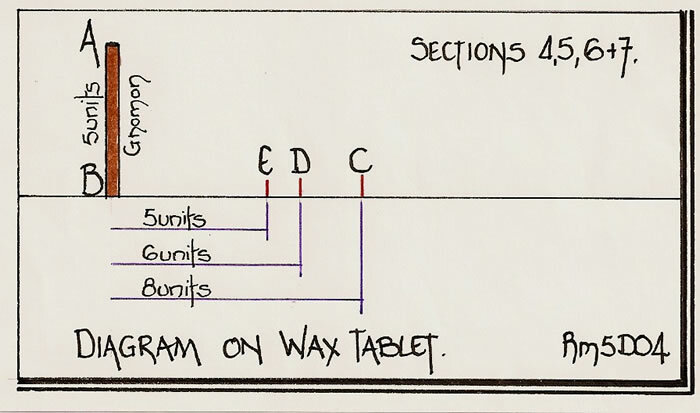 Thus we have an elevation of the actual ground plot, as a drawing to scale, on a wax tablet or similar.The next sets of instructions are drawing tasks carried out on the elevational diagram and require the use of a pair of compasses. 9) Next let us draw a hypotenuse from C to A and from D to A, and then with centre A and radius E, let us describe a circle. 10) Then let us draw lines parallel to the base, that is, the ground, onto the perpendicular (AB), from the points of intersection of the circumference of the circle and the hypotenuses – from F onto G and from I onto K.
The most important part of the methodology has just been described; the drawing of the lines FG and IK. It is these lines, which must be carefully measured on the drawing, if the next phase to be accurate. As already indicated, this is not the only method available. There is no reason at all why the so called “scale” drawing could not be a “full size diagram” drawn upon the adjacent earth surface. This would obviate the necessity to “Scale” anything as actual dimensions would be obtained. 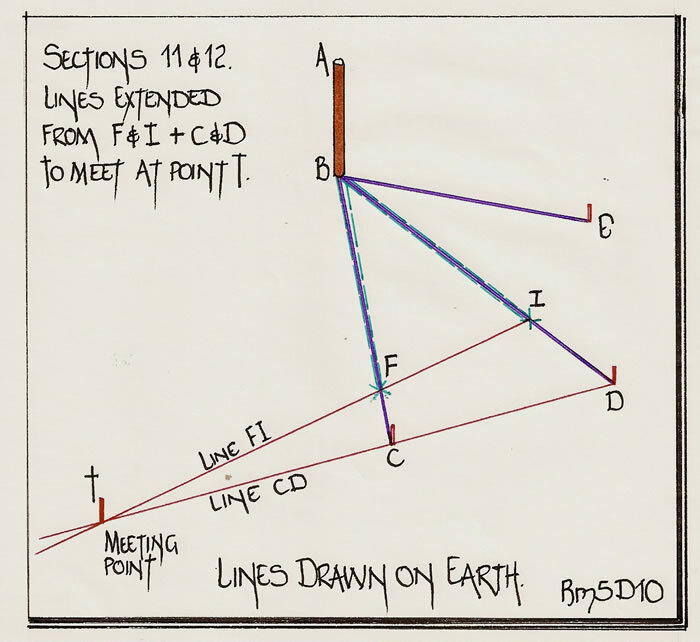 Thus, on diagram Rm5D08, we can see that the actual layout upon the earth can have had drawn next to it the full size “Drawing” and thus the accuracy is maintained to find a credible East/West. But that next phase is not on the diagram or drawing at all. It is in fact the transfer of lengths FG and IK as full scale lengths onto the shadow lines which have been marked onto the earth surface from the gnomon. 11) Then we shall apply the longest line, GF, to the largest shadow, and from point B we shall mark (the length of) GF; we shall apply the second line to the second shadow and we shall mark (the length of) KI. Thus on the two longest shadow lines there will be pegs or markers corresponding to the scaled lengths taken from the drawing. 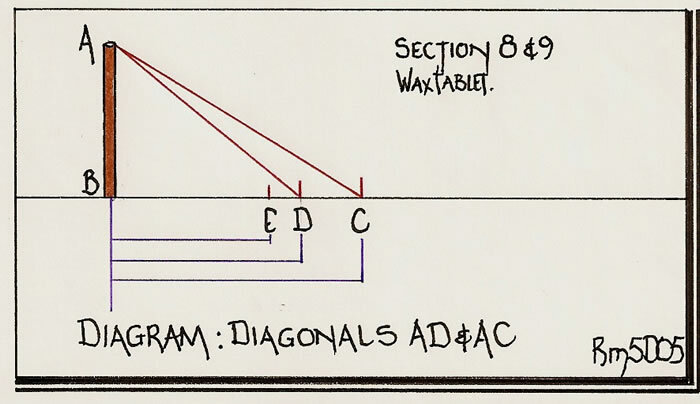 At this stage we therefore have two shadow lines with two markers, one the original end point, and the other the scaled point. They are C and D, then F and I. 12) Then from points F and I we shall project a straight line and similarly from C and D, the ends of the shadows. On the ground it is now necessary to stretch a cord across points F and I and extend it for a good distance forming a very straight line. Then through C to D and on towards the first cord a second must be laid out on the ground. Where these cross is our next objective. 13) These two lines will intersect each other at point T.
This point must either be marked by a peg or the two cords left in place for the next phase. 14) Next we shall draw a straight line from T and E.
A third cord is now used to join the two points T and E.
15) This will mark (the alignment) East to West. We have now achieved the first major alignment of our endeavours, and this line can be extended to the length required from East and West to form one axis of the centuriation, the Decumanus maximus. 16) From this line we shall draw a straight line at right angles, that is, perpendicularly, which will be parallel to the meridian (i.e. North/South). And thus we have the second major alignment, the Kardo maximus, which likewise can be projected outwards to form the cruciform of the setting out for a new centuriated area. It will be apparent to all that after establishing the lengths FG and IK on the drawing, as section 10 instructs, it is an absolute necessity that accurate lengths must be marked upon the actual shadow lines. Unless the drawing is correctly proportioned and can be measured with extreme accuracy, East/West will not be correctly aligned. This text therefore has all of the hallmarks of being an idea conceived by a mathematician or geometrician who knew entirely what he was describing, but not how to set the data concisely and consecutively as a list of instructions to be followed. From the Latin texts, Professor O. A. W. Dilke analysed the instructions and concluded that it was a geometrical construct which possibly had its basis in the Greek interest of conic sections. He concluded that ABC, ABD, ABE being naturally right angled triangles, and lines CA, DA and EA were natural alignments to the sun, i.e. all sun rays are parallel and thus singular shadows. The arc EIF is actually parallel to the Sun’s Path and thus the Equator. Thus the planes of the various parts of the construct are joined at T, and finally since point E, the radius point used to form line ET, is the intersection of a plane parallel to the equatorial plane and the horizon plane, it is thus parallel to the East/West line. If a study of the Corpus Agrimensorum, the text book of Roman Surveying is made, it will not indicate any such methodology for locating East/West or the Decumanus Maximus/Kardo Maximus. What has just been described is a theoretical construct devoid of practicality. But, should it have been written in the context of instructions to surveyors? Probably not! Consider this method; it was utilised by Roman surveyors, and is so simple to achieve. 1) Erect a gnomon – I suggest at least 5 pedes in height, but a decampeda (10) would be better. 2) Using the gnomon as a centre point scribe two or three circles on the level ground. The circles are of no particular radius, except to accord with the maximum and minimum shadow lengths at noon for the latitude of the gnomon. This would have been de rigueur for an Agrimensor. 3) But, to obtain maximum accuracy the circles should be preferably 10, 15 and 20 pedes radius. 4) Now, just watch the Sun’s shadow as it reduces from its infinite length in the West and swings through the northern section (above 240 latitude) of the ground around the gnomon to its shortest shadow length at noon. This is the zenith of the Sun’s traverse of the sky as it then falls towards the east and infinite length at sunset. 5) As the Sun’s shadow formed by the top point of the gnomon just touches each scribed circle line, a marker is placed. By the time the Sun is waning in the afternoon there will be four or six markers. 6) Using a cord line join the same circle marks. There will be two or three parallel lines. These lines will be precisely East/West alignment. 7) Mark the centre point of each East/West line and join through them to the gnomon base. That line will be exactly North/South, and will also mark the shortest shadow line made by the gnomon at noon. By this simple method, N S E W can be located without recourse to scale drawings or even knowledge of mathematics. The practical surveyor, be he a Geometre or Agrimensor, could use this system in the field anywhere in the Roman Empire, or in fact the world. He did not require a large wax tablet on which to draw his elevation; he did not require carrying a set of compasses; all he required was a pole and cords. This would be all that was required if the “diagram” was drawn at full scale on the adjoining earth, but the author is totally silent about the methodology. The Decumanus maximus and Kardo maximus are thus set out by a simple gnomon. The experienced agrimensor would utilise the largest circle available given the latitude and time of year in order that the base lines were as long as possible and thus gave the greatest accuracy when extended to the points of the compass. To draw an adequate representation of this text it was necessary to assume an East/West alignment and thus these, and the diagrams produced in this and other texts, are in fact false representations. 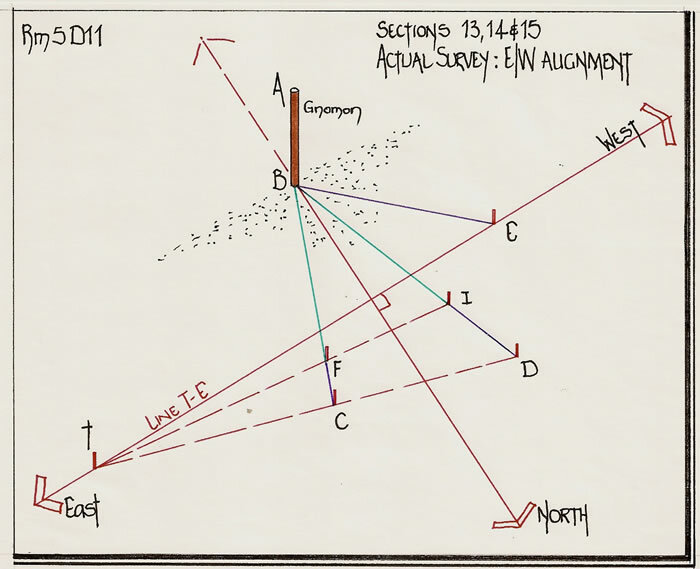 It must be borne in mind that the initial part of this exercise is an actual survey, knocking a post or gnomon into the ground and then watching the shadows as the sun passes across the heavens. Then, choosing three which are far enough apart to be meaningful and marking them on the ground. This method is not a surveyor’s concept, but a mathematical concept using geometry as a tool, a means to an end for its own sake. 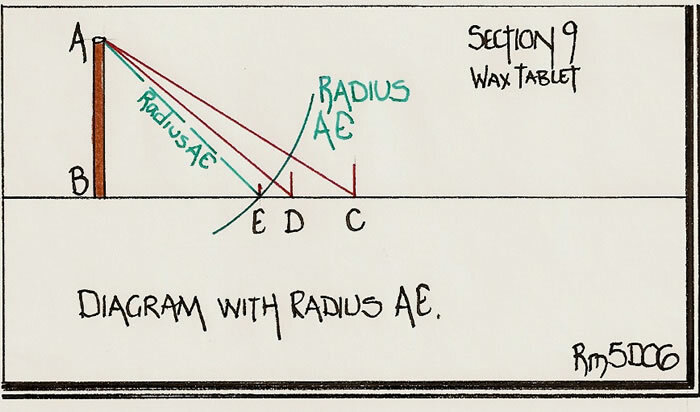 It is impractical to use in the field and has the added error of transferring scaled lengths from a drawing to the actual shadows on the ground. It would be hard to produce any form of accuracy and thus true East/West or North/South as desired by the author. The establishment of any new land for either a Town or its cultivation area required the survey setting out of two or four lines from a single point, at right angles to each other. They are the Decumanus maximus and the Kardo maximus, the most important lines imaginable for such works. Although these lines need not (and inmost cases did not) follow the cardinal points of the compass, the Decumanus was usually in an east/west direction and the Kardo, north/south. “If the place where a colony is being established is under cultivation, we shall begin the Decumanus maximus and the Kardo Maximus from the town itself, and similarly if the colony is being set up from scratch. The best surveyors ought to plot the decumanus maximus and the kardo maximus, and similarly they should complete Quintarii individually, in case a mistake occurs in the work that is difficult to remedy without embarrassment after much of the task has been completed. If there has been a fault in surveying equipment or in the sighting, then a conflicting observation is immediately apparent in one quintarius and can be tolerably easily rectified. The Subruncivi contains less risk of error. Nevertheless we must plot these with equal care, in case the Rm5D14a need to correct these imposes any delay. Many (surveyors) have established continuous limites and have erred by persisting in the procedure, as I discovered in the territories of the old colonies, and more frequently in the provinces, where they do not employ the Ferramentum (Groma) except at turns (in the boundaries). We shall lay out a straight line using surveyor’s marks and by means of that measure horizontal distances to the perpendicular. We shall fix wooden stakes every 120 feet to mark off Actus, each of them inscribed with its own number, so that it may be clear that a survey has been carried out for the division of the holdings. 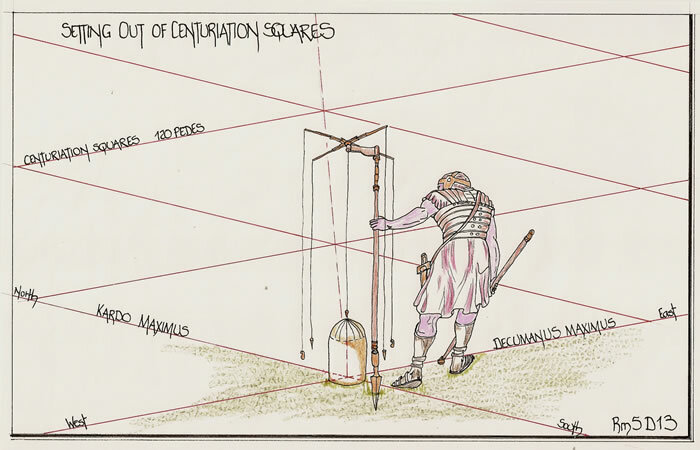 The surveying equipment alluded to in the text could be , The Cross Staff (stella); the Plumb line level (libra, libella); Ranging Rods (decampeda, pertica) and the Groma, used for sighting lines and right angles. A Groma is described in my text Rm3, which discusses construction and utilisation there-of. The basic land measures used in Roman territories are ; Actus Quadrati, 120 x 120 pedes; Jugera,120 x 240 pedes; Heredium, 240 x 240 pedes; finally, a Centuria of 100 Herediae. We do not have written explanations of the above basic land measures and particularly the reason for the 120 pedes length. This is both a decimal and duodecimal unit being 10 x 12 pedes. The literal translation of ‘ACTUS’ is; “moving, driving, right of way for cattle or vehicles”, but it is also a square measure and only a length when called the ‘Actus Simplex’. Then it is a footpath of 4 pedes width and 120 pedes length. The method of driving cattle is normally to use a narrow confined path or the adjacent lands are heavily trampled and this width is quite adequate for persons or single cattle, but for a vehicle such as a cart it would require twice the width, or 8 pedes. A major route would be 12, 16 or 20 pedes. If we look at the requirements to set out a survey, there is perhaps a simple explanation. The main right angle crossing of the Decumanus and Kardo lines has been established, and from that point, two (4) lines can be extended into the landscape. Along each line the desired measurements can be marked. 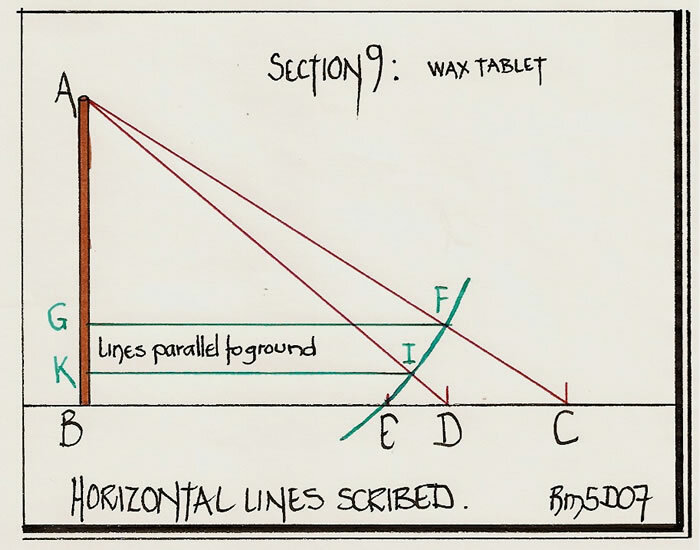 Then at these points it is necessary to establish a right angled line to form eventually the square or rectangle. If this is carried out simultaneously from the Decumanus and Kardo lines then the two lines should meet at a right angle, and, if it is to be a square Actus all four sides should be precisely the same measurement. But that must be ascertained, and the only method accurate enough to ensure correctness is to measure the diagonal of the square. Consider this fact; squares have a diagonal which is always √2 larger than the side length. The √2 is an irrational number which can only be approximated as a ratio, such as 99/70. Thus it is necessary to find a side length which will give a whole number, or very usable number for its diagonal length, and be of a good accuracy. Mathematics using Roman numerals is cumbersome. Therefore the use of mathematics or geometry whilst in the “field” surveying/setting out large tracts of land would require to be carried out using only basic knowledge, easily remembered and easy to utilize. 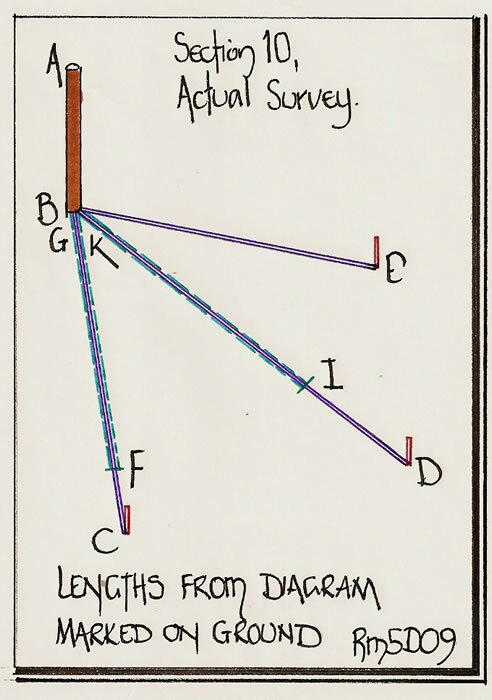 To set out a right angle the simplest tool to use in surveying is the “Pythagorean right angled triangle”. These are a series of triangles which have whole integers for all three sides. The first is, 3:4:5 then 5:12:13 and 8:15:17 with their multiples. But these are not squares, and if we investigate those we find a surprising fact emerges. 8:8 = √128 or 11.3137:/ 9:9 = √162 or 12.7279:/ 10:10 = √200 or 14.142:/ 11:11 = √242 or 15.5563 and 12:12 = √288 or 16.97056. Thus we can see that a square, side length 12 units, has a diagonal 16.97056 units, practically 17. In fact the figures are, (12 x 12) + (12 x 12) = 288, and, (17 x 17) = 289. Recalculate this with a square of 12 feet and the diagonal is 16.97056 feet, which is 0.029437 feet or 0.35325 inches, a discrepancy of just over 1/3rd of an inch. This is well within survey limits! Increase the scale to 120 feet, the Actus Quadrati, and we have a diagonal of 169.7056 feet as opposed to the 170 feet pseudo survey line. The discrepancy is 0.2944 feet or 3.5328 inches. If a survey is carried out using a series of posts and a series of cord/string lines (or worse a decampeda laid end to end 12 times for an Actus length) the accuracy is questionable. A land surveying handbook of the 20th century states,” under ideal conditions the greatest accuracy that can be expected from a plastic tape is 1/2000, but, in practice 1/500 or less will probably be achieved”. The point made is that a plastic tape can and does stretch just as a cord/string line and thus the discrepancies in a 120/120/170 diagonal length square are well within survey tolerances and recognition factors of an error. Itinerary measures use the Roman Mile or mille passum which is 1000 paces. The pace is a double step, i.e. left right left, and is measured at 5 pedes. Hence the Roman mile or mpm is 5000 pedes. 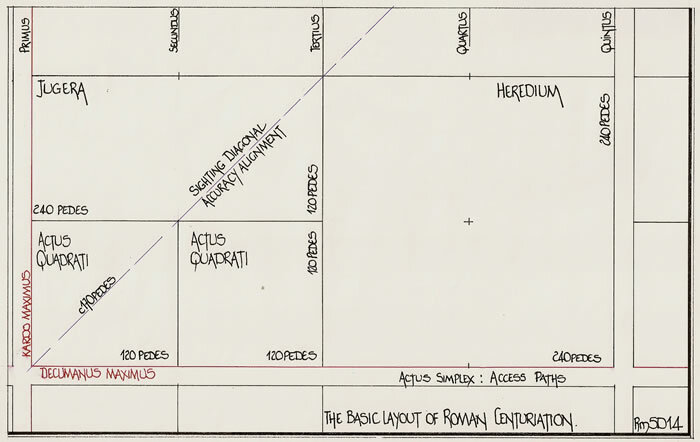 Land measure is based upon the 120 pedes Actus Quadrati. Thus the mpm and the AQ are not integrated into one system as there are 412/3 AQ in the mpm. But at the micro level, 120 pedes = 24 passum and hence the 120:120:170 square/triangle is also 24:24:34 passum. The decimal unit comes from the utilisation of a decampeda, a 10 pedes rod. 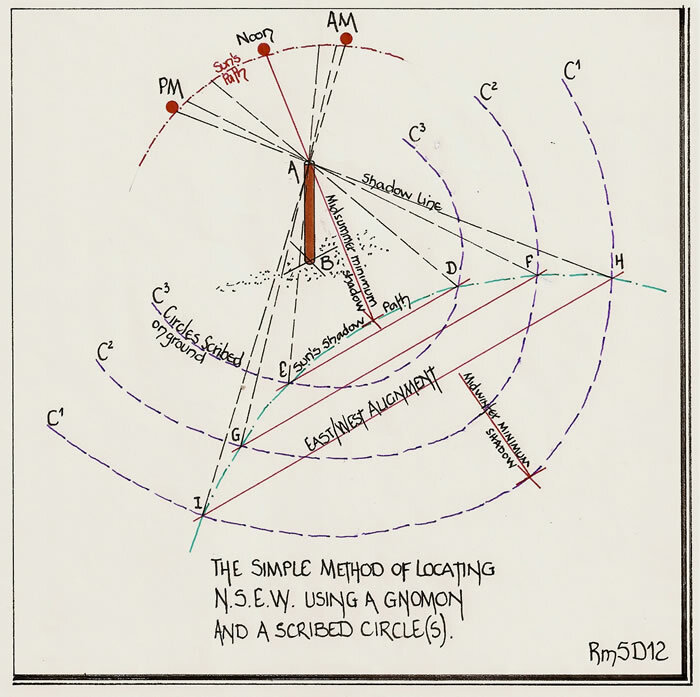 For an agrimensor/geometre to work accurately but without the aid of a “computation machine” he would require learning by rote the interlinking geometry of a survey. Thus memorizing the “Pythagorean triangles” and those which can also be used, such as the 12:12:17 triangle, he had an arsenal of tools at his disposal. The accuracy of the survey setting out for a new area of centuriation was determined by the precise right angles and exact measures (within the tolerances indicated). How accurate these Agrimensores were we cannot actually tell unless we find the bornes or field markers still in place. Thus, we can only measure the approximate field boundaries plus track widths to guestimate the metrology of the layout. However, from the land of Tunisia, Northern Italy and Orange in France, we see extensive centuriation and know that the Agrimensores work was on a rather grand scale. 3) Dilke, O.A.W. “The Roman Land Surveyors”, David & Charles, Newton Abbot, 1971. 9) Ferrar, M.J. “Rm4, Agrimensoral Texts; Practice or Theory”, posted on this web site 2010. 10) Wilson, J .P.Ramsay. “Land Surveying”, M&E handbooks, Plymouth. Chapter 2, Chain Surveying, pp22-56. Page 22, accuracy, 1:2000 but actually only 1:500 or less. 11) Ifrah, G. “The Universal History of Numbers”, The Harvill Press London, 1998. Ch 16.